Forget About Moynihan Station. The Deal Is Just About Dead. The 1999 SOM rendering. It was beautiful then. It's meaningless now. 2002: The project to transform the Farley Post Office into Moynihan Station is re-started. The State of New York acquires the Farley Post Office from the Federal Government. 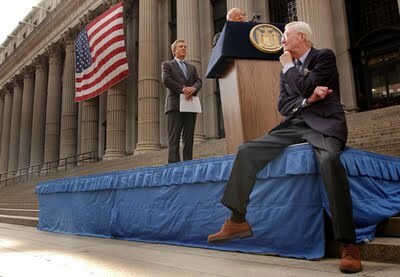 A press conference is held (one of Moynihan's final public appearances) to announce that work would soon begin. It didn't. 2005: SOM looses the project, and it is reveled that HOK (the famous stadium builder) has done a re-design. The refreshed project is less technologically advanced than the SOM design, but by then, the estimated cost of opening the new station had surpassed the original $900 Million. 2006: The plan goes back to SOM. A third design is unveiled. We learn that commercial real estate giant Vornado wants to get involved, and include one or two office towers with the station. 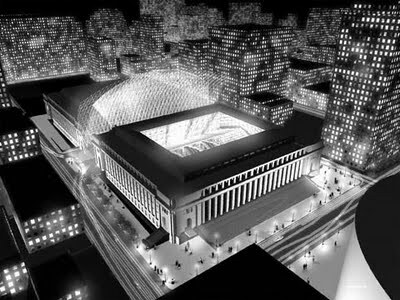 It didn't work with the basement Penn Station / MSG / One Penn Plaza back in 1964, so why not build another faiulre? The Dolan family (Cablevision) then gets involved (always a bad sign, right?). The Dolans want to leverage the plan to fit-in with their grand scheme to build a new Madison Square Garden on 11th Avenue, just west of the Farley Post Office. Vornado would build its new towers where One Penn Plaza and MSG now stand. Estimated price tag skyrockets. 2006: The project is dealt a huge blow. Amtrak announces that it won't be moving into its new home, because under the proposed arrangements, it would have to pay rent, which it wouldn't be able to afford (for obvious reasons). So now we're thinking about building a world-class train station just for New Jersey commuters? Travellers to and from southern New England will remain with the rats in the MSG basement? This is looking bad. 2007: The project, assumed dead, is briefly resurrected. The proposed towers get higher. How about 1,200 feet? That's about 100 feet taller than the Empire State Building two avenue blocks east. But how would this project, now estimated at $2 Billion, be funded? Would now be a good time to mention that the $900 Million pledged by the Clinton Administration in 1999 was taken-back by the Republican Congress after The Day That Changed Everything? Yeah. It went to contractors in Iraq or got absorbed by tax cuts. 2008: The project is in its last throes. Time to call it, doctor? I say, call it. It's a shame. But this is what happens when a project designed to improve the lives of New Yorkers becomes a giant urban planning project no one needs (except the developers and land owners), and then collapses under its own inflated budget and lack of justification for the tacked-on commercial space. Also, keep in mind the project was intentionally delayed by NY House Speaker Sheldon Silver just to prevent Governor Petaki from ever seeing construction begin or to take any credit for the project while in-office. That just strengthens my argument for New York City to secede from the State and become the District of Gotham. But that's another post for another time.